After a long day at work and a slow bus journey home, The last thing I need is to be spending forever in the kitchen making dinner. Most meals that I serve up on a work night are ready in less than 30 minutes and this delicious stir fry was no different. Tip : Make sure all of the ingredients are prepared and ready for use because the cooking process is very quick. Slice the chicken breast into very thin strips and place in a bowl with a splash of rice wine vinegar and light soy sauce. This will start to break down the protein strands in the chicken and allow the meat to take on the other flavours when cooking. Set the bowl to the side until needed. Heat a little groundnut oil in a hot wok. Once the oil begins to smoke, add the shallots into the wok. Keep the contents of the wok moving to stop them overcooking. Add the garlic 30 seconds after the shallots. As the garlic starts to colour, add the chicken and spring onion into the wok making sure not to add too much of the vinegar and oil that will have pooled in the bowl. The chicken will cook quickly so keep an eye on the wok, making sure that the contents are not catching on the bottom of the wok. Once the chicken is cooked through, add the hoisin sauce, stirring until heated through. If your sauce looks a little dry, you can add a splash of water to help thin it down. Once your sauce is heated through, you can serve up your stir fry with rice or noodles. Last night I cooked my long grain rice along with an Oxo Chinese stock cube, which flavoured my rice with the aromatic flavours of Chinese five spice. 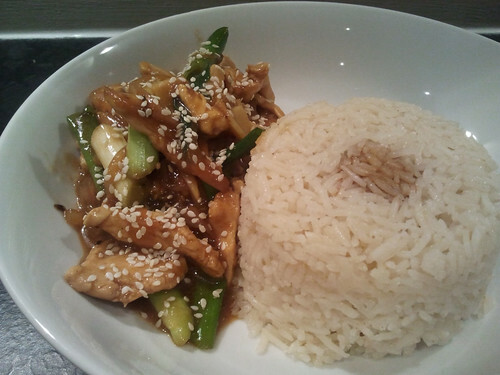 To finish, you can garnish the dish with toasted sesame seeds or finely slice spring onion.